Whether you live alone, as a couple, or as a family of three or more, the living room is the one room in the house that will be used more than any other – it’s where we entertain guests, relax in the evening, and do everything else in between. 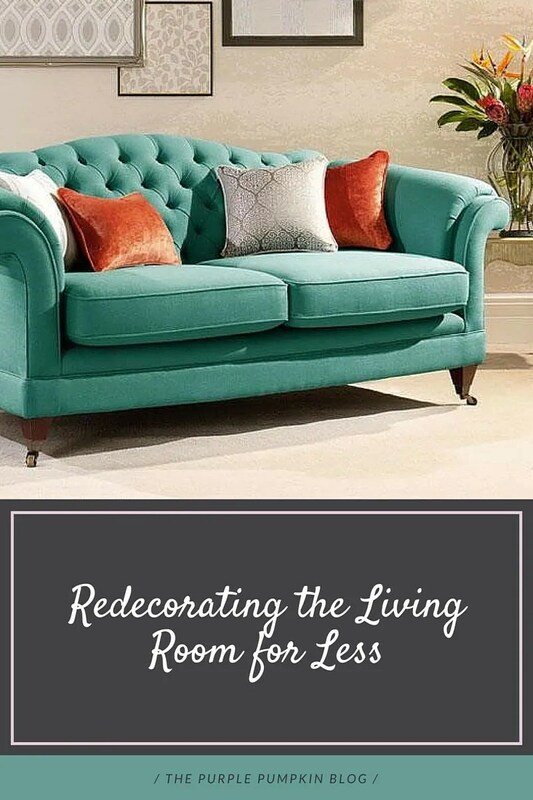 This also means that it’s the room in the house that needs a makeover more often than any other, all of which can be an expensive business, unless you follow these top tips to redecorate the living room for less. The sofa is the focal point of every living, which means it’s the one single item of furniture that gets used more than any other – even if you have a teenager who never seems to leave their room, the chances are that once the rest of the family are tucked up in bed they’ll creep downstairs to crash on the couch and watch trash on the telly. Its position as the most used item in the house means it’ll probably get worn out before most other things – the trouble is, a new sofa doesn’t come cheap, and if you’ve got one that fits nicely in your living room and comfortably seats the whole clan, you’ll loath to get rid of it. So why don’t you just give it a makeover instead? If you’ve a sofa that’s in fairly good condition but has a skirt around the bottom that makes it look dated, you can simply whip the skirt off and attach some decorative legs to give it a more contemporary lease of life. If your couch is looking sunken, saggy and more than a little sorry for itself then just knock the stuffing out of it and replace it with some Poly-Fil batting, and maybe even reupholster the covers to give it a completely new look – just pick up loose covers from Plumbs, and either get to work yourself or get the professionals in to do it. The television is the centrepiece of most living rooms – it’s usually the one thing that all the furniture is pointing towards – and given that most modern TVs come with a very basic base to stand on, you’ll most likely need a sturdy stand to house things like the DVD player and games console. The trouble is, those old glass and metallic frames just don’t cut it anymore. But before you go and buy brand new, think outside the box, or at least outside the living room – an old wooden dresser, for instance, can make for a great modern TV cabinet. Simply give the old wooden dresser a new lick of paint, take out the top drawers to house any other entertainment equipment, add new handles to the others and pop your telly on top. The extra drawer space can then be used to house your favourite DVDs, games, controllers and remotes when not in use. Once you’ve picked a finish for the wooden dresser/TV cabinet, simply apply the same finish to any other wooden items in use to complete the cheap and easy, not to mention fabulous, living room makeover. Have you ever given your living room a radical makeover without breaking the bank? Let me know your top hints and tips! Bathroom Renovation – Day by Day	Greetings Cards from Postsnap – Ideal for Father’s Day! + 10% Discount Code! You make such a good point about the sofa. We’ve discovered ours has a huge splodge on the front bit below the cushions. Time to get out the sponge and handwash detergent in addition to restuffing the cushions!